Thanks for your interest in my “Go Digital…” article in the October 2018 issue of QST magazine. The article text that I submitted to QST was way too long, about eight pages and QST’s limit for publication is five pages. I want to thank the article’s QST editor, Kai Siwiak, KE4PT, for doing a great job of trimming and massaging my submitted text down to size and getting the article in proper shape for publication in QST. As mentioned above, there was extra info that we couldn’t include in the article that might be useful to those who want to construct the Go Digital interface. I’ve placed that info in the area below. Some is based on info that I would like to share with others, as well as responding to questions from readers of the article. With that as background, here we go, in no particular order. What USB Dongle Did You Use? – Or What Dongle Do You Like? I tried several dongles for this project. My only limitation was that I stuck with dongles that cost less than $5. I got all of them, except one, on ebay. The low cost dongle that I liked best is shown in the photo below. I’ve seen these on ebay on Buy-It-Now for anywhere from 80 cents to $4. Not all dongles that look like this on the outside are the exactly same on the inside, but they are fairly similar to each other. This particular dongle includes an LED that binks when connected to the computer. It’s a nice feature but the on/off current draw from the LED caused audio noise in my system. If you experience rhythmic periodic noise in the audio from the dongle that’s in cadence with the LED flashing, then remove the LED and see if that solves the noise problem. It does on the dongles I’m using. When you get a dongle (or several dongles) in preparation for building this project, you should first test the audio input and output capabilities of the dongle as a standalone device, to ensure that it behaves as expected. Do some Googling and you will find MS Windowstm programs for sound cards that will function as an audio oscilloscope and signal generator. Two Windows programs that I found useful are Christian Zeitnitz’s Soundcard Scope ( https://www.zeitnitz.eu/scope_en ) and RingBell’s Tone Generator ( http://www.ringbell.co.uk/software/audio.htm ). With these programs, or similar programs, you can see how much audio AC voltage output you can get from the dongle audio output before clipping occurs with a low resistance load. Use the oscilloscope function to see how much audio AC voltage you can apply to the microphone input before it clips. An interesting thing about the white dongle that I used is that the Windows 10 device driver (that driver seems to be included as part of W10, I didn’t install any special drivers for this dongle) shows an option for AGC. With AGC option selected in the device driver the microphone input would clip with about 30 mV rms at the input, but with AGC option un-selected the dongle became fairly deaf, requiring about 1 V rms before clipping would occur. 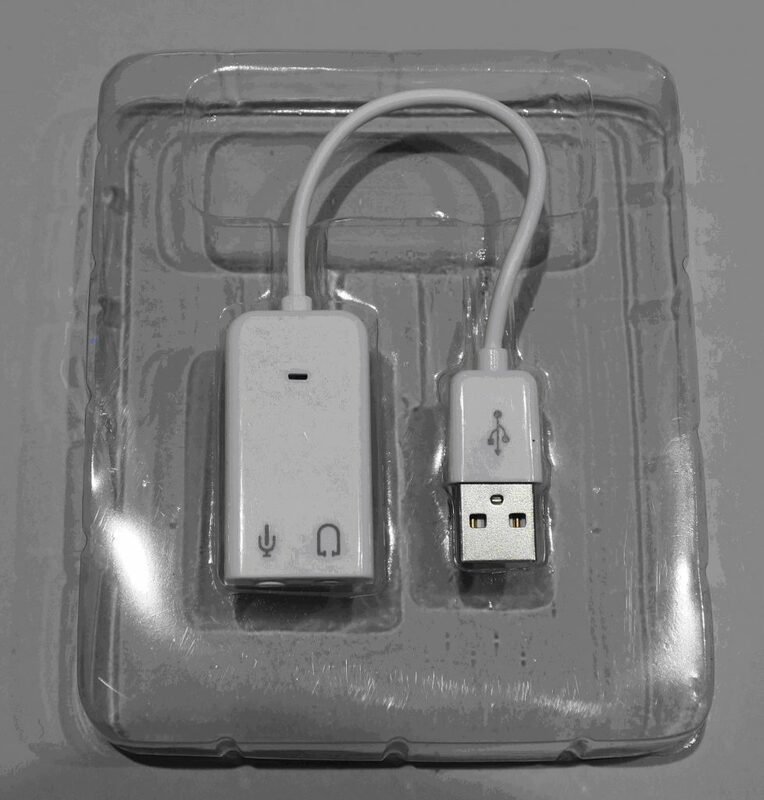 Below is a test fixture that I used to test USB sound dongles I was considering using for my interface. To test the audio output of the dongle I would connect TP1 and TP2 to an oscilloscope to observe output level, clipping and distortion, when using a Windows-10 signal generator program. To test the audio input I would connect an audio signal generator to TP3 and use a Windows-10 audio oscilloscope program to determine the input level at which clipping would occur. The two pin headers near TP3 allowed me to select different attenuator values, depending on the capabilities of the audio generator I used. Do you really need to have 12 steps of attenuation at 5 dB per step? Well, no, probably not. But with that range of possible attenuation you are almost always going to be able to sufficiently knock down whatever signal comes from your radio receiver, even if it’s driving 5 watts into an 8 ohm load. Although it takes a bit of time wiring the step attenuators (maybe 15 minutes each) they are cheap to construct. I found 12 position rotary switches on Ebay for about $1 each. Those $1 rotary switches are not high quality, so I wouldn’t expect them to survive 100,000 operations, but in most cases once you adjust the attenuators for a particular radio, further attenuator adjustments will be infrequent. One alternative to the step attenuators that’s worth trying is two cascaded potentiometers; one for coarse control and the other for fine control. Given that both the radio’s speaker driver and the dongle’s audio output driver are intended to drive relatively low impedance loads, we can use the shunt resistor on the wiper trick to get linear pots to function somewhat like log taper pots, which will increase the range of controllable attenuation. For the coarse control I’d suggest a 100 ohm pot with a 22 ohm wiper shunt resistor, and then the fine control pot (the second pot) consisting of 1000 ohms (high side connect to the wiper of the 100 ohm pot) with a 220 ohm wiper shunt. I haven’t yet tried this, but if you try it, please let me know how it works for you. One issue with this approach is that it’s hard to find inexpensive 100 ohm pots. 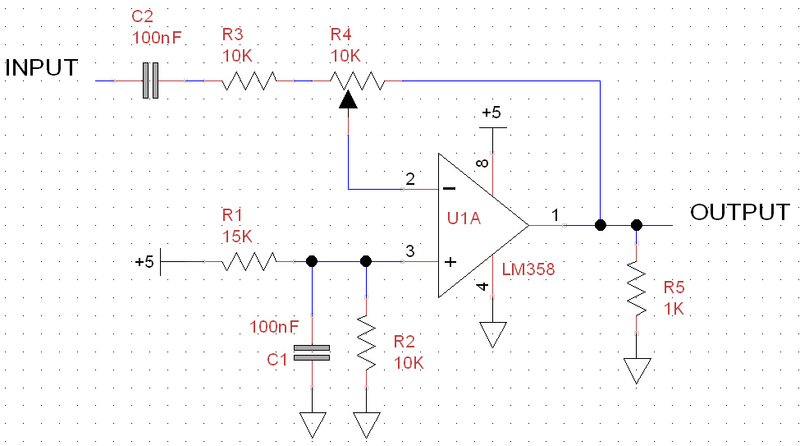 Another lower cost alternative to obtain variable attenuation would be to use a 10K pot connected to an inexpensive LM358 op-amp. One might even want to consider an IC based digital potentiometer with push-button up/down controls (for one example, see https://datasheets.maximintegrated.com/en/ds/DS1802.pdf ). There are many ways achieve the needed loss while allowing user control. One other consideration for the attenuators: I found that I didn’t need a “fine” control for the receive path. Getting the level to within 5 dB seemed to be good enough on receive. For the transmit path, I like having a fine control knob so that I could easily and quickly adjust my transmit power up or down to hit 20 watts of output power on the nose. I realize that both WSJT-X and fldigi provide an on-screen slider to adjust TX audio (and thus RF transmitter power), but I find it easier to grab and rotate a physical knob rather than using a mouse to move an on-screen slider. In the Go Digital QST article I didn’t say much about CW keying. But I would like to point out some things about using the interface on CW that are radio specific. I designed the interface for use with my 30+ year old TenTec Omni C and TenTec Triton IV HF transceivers. With those radios the Key input is ignored whenever the radio is *not* set to CW mode. So it was no problem to leave the interface key output connected to the radio’s key input. The interface would only activate the transmitter via the key input when the radio was in CW mode. Life was good. I’ve subsequently tested the interface with a modern radio, a Yaesu FT-891. With that radio, regardless of the “mode” the radio is in, if the key input is active the radio will transmit CW. That’s not a bad thing; actually it’s probably a good thing. But, because the Go Digital interface’s key output is active whenever the interface engages the PTT for digital modes, you may want to either add a switch to your interface in series with they key output (to disable it when you don’t want to send CW) or just disconnect the CW plug on the back of your radio when you don’t want the interface cause your transmitter to send CW. Do you really need non-polarized capacitors for C3 and C6. Maybe not, but when I don’t absolutely know for sure what I might be connecting the interface audio ports to, I like NP caps on the audio input and output. I found some inexpensive ones on ebay, but you can also get them from Mouser or Digikey. Do you really need the 470K resistors across C3 and C6? Yes, you really should include those. But the caps don’t have to be exactly 470K. 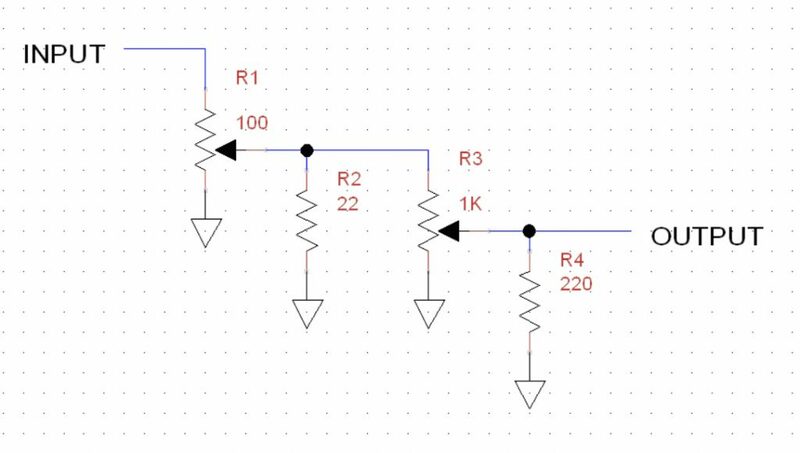 Anything from 47K to 4.7M is likely OK. One of the rules for any electrical design is “no floating metal”, and that includes the net between two capacitors connected in series. We don’t know for sure, in every case, that the interface will connect to a radio with a DC path to ground for both its input and output, so we need to provide one, and that’s the purpose of the 470K resistors. 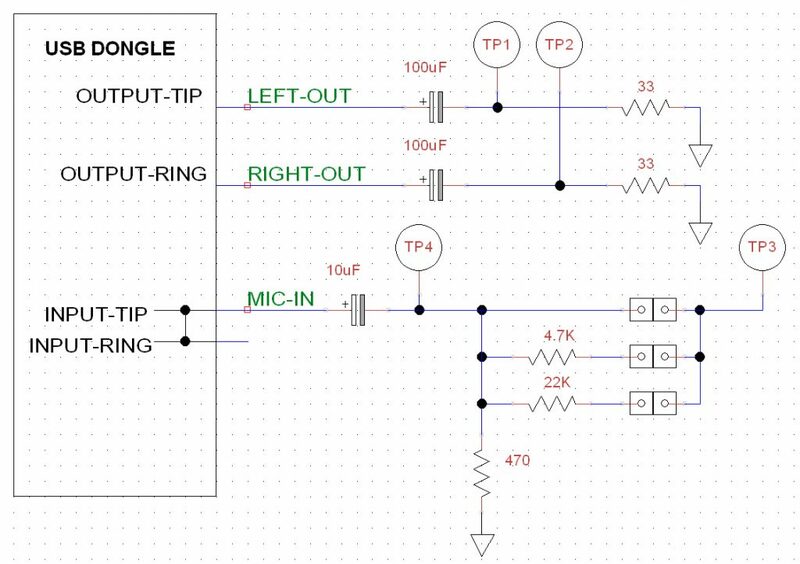 In the case of most speaker outputs from modern radios, those are almost always capacitively coupled. Regardless of what you are transmitting (CW, SSB, Digital Signals) it’s always helpful to have a way to monitor your signal. An easy was to do that is with an inexpensive Software Defined Radio module connected to your station computer or an old laptop computer. To monitor my transmit signals I use an SDRplay RSP1A connected to an old laptop. That allows me to monitor the modulation of my transmitted signals and spot any problems that might crop up. You can also ask a nearby station to monitor your signal with any program that shows a waterfall. One of the best indications that you have an RFI problem is when the RF power does not smoothly increase or decrease as you smoothly adjust R15, the fine level control on the TX attenuator. If you think you have RFI problems be sure to double check that your transmitter and your interface are connected to a common ground point by means of short ground wires, something relatively fat like #14 or #12 solid conductor (don’t rely on the ground wire in the audio cable that connects the radio to the interface for RF grounding). Keep in mind that for ground wires of the same diameter, solid wire is almost always better than stranded wire. I spent hours trying to resolve an RFI problem with one of my interfaces, only to find that the ground wire on the radio had been disconnected; when I reconnected the ground wire the RFI was gone. If simply having proper ground wires in place are not enough to solve your RFI issues, then Ferrite mix 31 is usually a good place to start for mitigating RFI problems in the HF range. FT240-31 torroids will usually let you pass a few turns of cable through them. Only use the clamp-on style of ferrites when using a torroid is not an option (usually due to big connectors at both ends of the cable that won’t fit through the torroid).